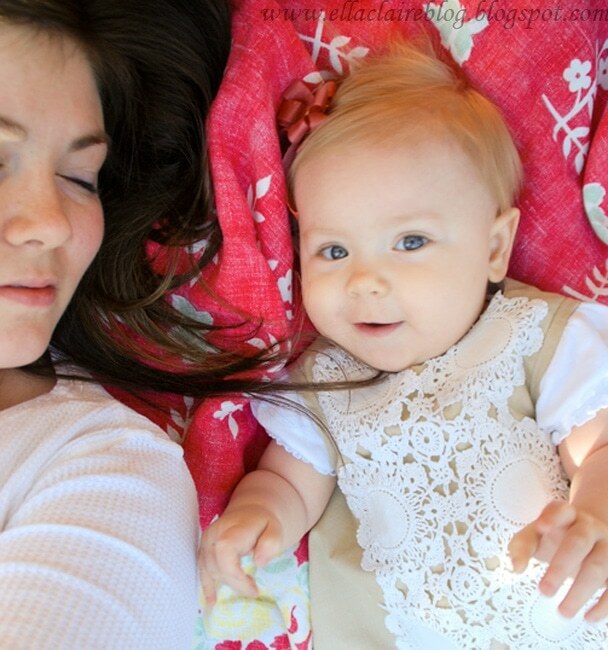 While Ella was taking a nap yesterday, the sun was shining, a cool breeze was blowing and it was so lovely outside. 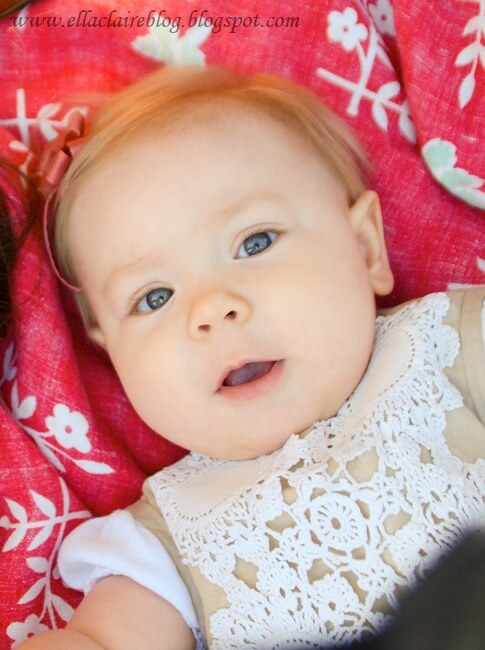 So, I decided that it was a perfect day for Ella’s first picnic! I found a shady spot in the yard and set up a little picnic for us. I wanted to surprise her with a pretty little spot for us to sit and visit. So, I pulled out bright, fun colored things for her to enjoy to look at. I brought out the banners I made here and here along with a couple others. I also thought that our little party called for a fun outfit. So, I pulled out this dress for her. 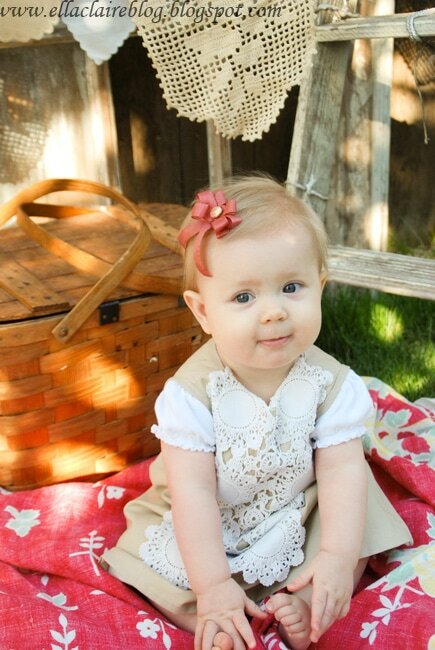 It is another dress I made for her while I was pregnant, except on this one, I hand stitched an antique doily to the front. Are you sick of seeing my homemade dresses yet? I don’t know what came over me while I was pregnant. I guess instead of nesting, I sewed dresses. When she awoke from her nap, I think she was pretty surprised. 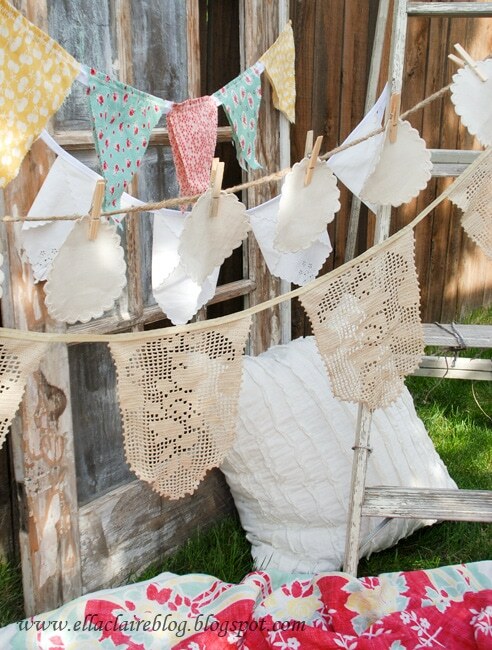 and then we laid under the buntings and watched all of the colors and shapes sway in the wind. This was my favorite part of our picnic. I think it was Ella’s favorite part, too. She talked, and talked, and talked… like any girl would do. She shared all kinds of wonderful secrets with me. And, I felt like such a lucky mommy. I just listened as she told me story after story. Sometimes her expressions and voice were so animated that it made me giggle. She was so excited. I can’t think of a better way to welcome the summer! I have a feeling we are going to have a lot of fun together in these next few warm, beautiful months. So precious and great shots. Popping in from Kristin’s. Beautiful pictures! 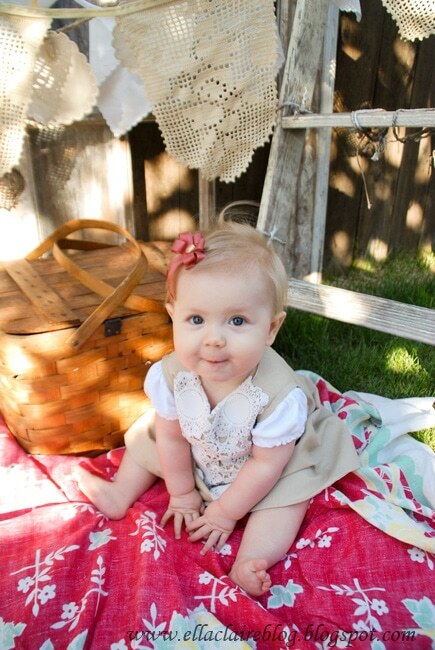 Your baby girl is just precious! Congrats on your feature. Your blog is beautiful! Found you at Kristin’s. I am your new follower. Good Morning! I found you at Simply Klassic~you are your little girl are precious! What a wonderful way to spend the afternoon! 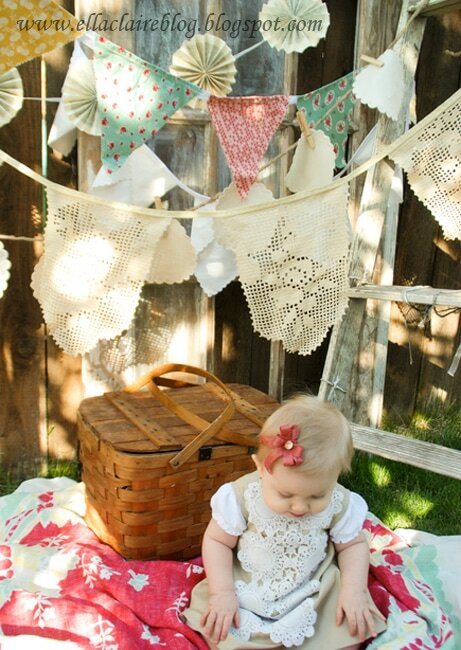 So many great ideas here and the little girl is just irresistible! Congrats on your Newbie Spotlight! I just found your cute little blog! I’m so excited for you! It is already amazing! I can’t wait to see more of your “domestic goddess” skills here! You completely inspire me! This is the most adorable thing I’ve ever seen. You are the best. Oh KRISTEN!!! These are adorable!! 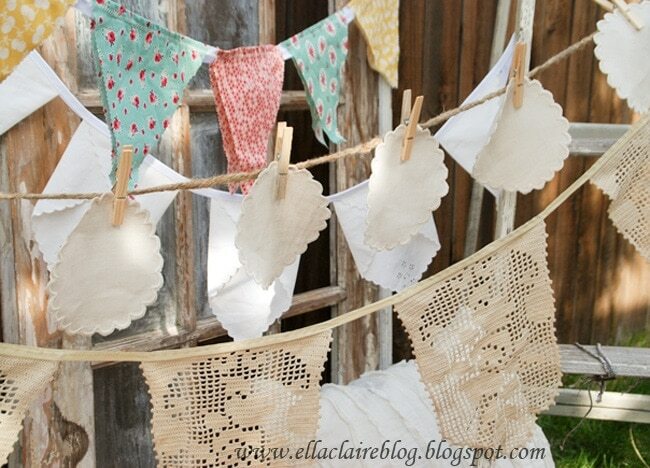 What a sweet idea! You are such an amazing mommy! Kristen! I love those shots of you both–gorgeous! And I’m so glad you’re finally getting a little recognition for all your amazing ideas and achievements. Love you girl! What a lovely post! When my 22 year-old daughter comes in from college late at night, she sometimes stops to lay next to me on the bed while I’m reading. 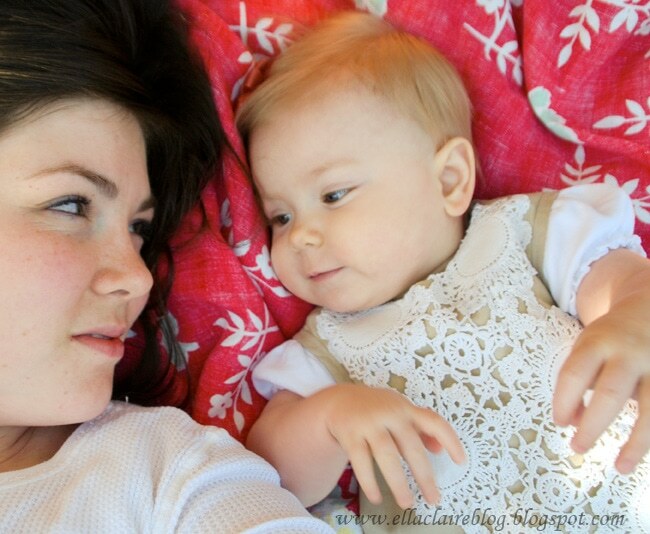 And if I’m quiet she starts talking just like Ella Claire and tells me some of her wonderful secrets, too. 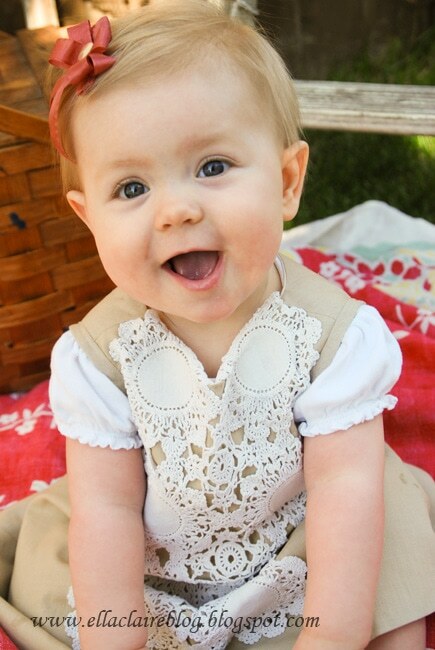 Having a daughter is a lifetime of joy. Wow she’s simply beautiful. Love all the photos! This is such a heartwarming post. 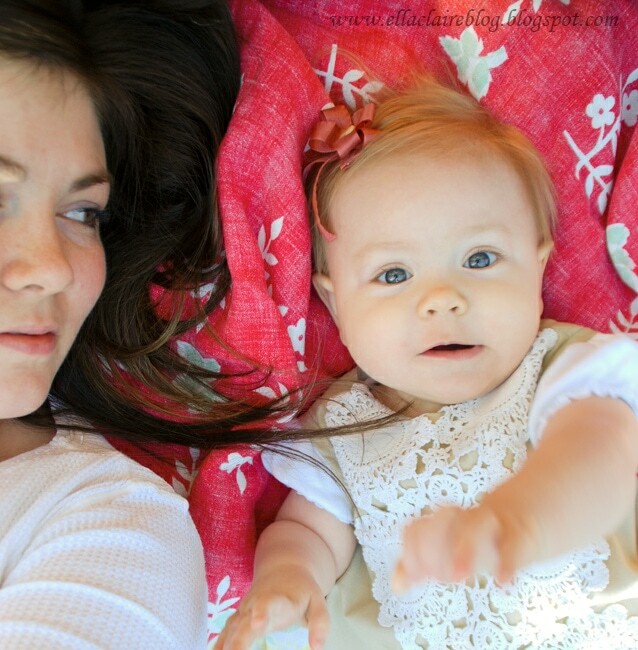 You have a beautiful little girl and your blog is one of my favorites so far. Wishing you so much happiness!! 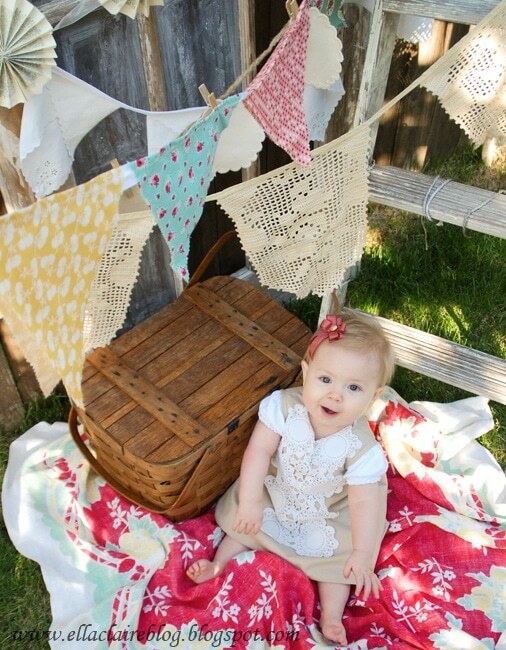 Beautiful baby girl and wonderful picnic! I love to do backyard picnics with my grandkids! just about every time I come visit your blog I HAVE to look at this post and the beauty of it….the decor and you stinkin cute girls! all delightful!